Originally posted: April 4, 2018 . Last modified: November 29, 2018 . Enchilada Casserole – An easy enchilada casserole made with two types of cheese, green chiles, and roasted tomatoes. A great recipe for your next Cinco De Mayo celebration. Cinco De Mayo is fast approaching and everyone is getting their menus together. Kim and I had a few ideas we wanted to share with you. For today, we’re starting with our easy enchilada casserole. It’s so simple to prepare and loaded with Tex-Mex flavor. Using simple ingredients, like roasted chiles and tomatoes from a can, I’m confident anyone can create this cheesy dish for their next Cinco De Mayo dinner party. First, start by preparing all your ingredients in bowls. Prepping ingredients will always make the cooking process flow smoother and ensures you don’t miss anything important. Next, go ahead start making the cheese sauce as it’s needed to build the enchilada casserole. In a medium-sized saucepan, add the milk and cream cheese. Make sure to stir the mixture as the cream cheese melts. Next, add the shredded cheese in small handfuls, a little at a time. Last, continue stirring the ingredients as the cheddar melts to create a smooth, creamy cheese sauce. 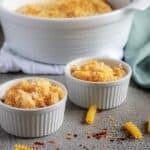 The first step involves preheating your oven to 350 degrees F. and spreading a few tablespoons of cheese sauce into the bottom of a 9×9-inch casserole dish. This keeps the tortillas from sticking to the bottom of your pan. Step two is when you start building the casserole. We tore the tortillas in half and laid in the dish, then added the tomatoes, chiles, shredded cheese, and even more cheese sauce. Now, repeat that same process over and over again until the dish is full or you run out of corn tortillas. If you have any leftover shredded cheese, go ahead and sprinkle over the top of the enchilada casserole. Last, cover the dish with aluminum foil and place it in the oven to bake for 20-25 minutes. Remove the foil lid and allow it to continue cooking for another 10-15 minutes. Serve the casserole while it’s hot. Remember, the quality of cheese matters! The cheaper the quality, the more “processed,” the dish will taste. Don’t be afraid to spice things up a little, you can add cumin, chili powder, and cayenne to your cheese sauce. Serve the casserole with sides like tortillas chips or Tex-Mex rice. Can beef or chicken be used in the enchilada casserole? Yes, absolutely! Shredded chicken or beef or perhaps even cooked, ground beef would work great in this recipe. Simply layer the meat in with the other ingredients. If you’re looking for an easy seasoning mix for the chicken or beef, give our taco seasoning a try! Can the enchilada casserole be made ahead of time and frozen? Yes, this casserole makes an excellent “make ahead” freezer meal. Simply assemble the casserole completely but instead of baking, wrap it tightly with heavy duty aluminum foil. Before baking, make sure to thaw the enchilada casserole completely then bake as directed. The casserole may be frozen up to 2 months. Looking for the perfect side dish? Try our Homemade Tamales with Cheese and Green Chiles. If you like this enchilada casserole recipe, please leave us a comment and rate the recipe card. You can also find us on Facebook, Pinterest, Twitter and Instagram searching for Berly’s Kitchen! A simple enchilada casserole made with two types of cheese, green chiles, and roasted tomatoes. A great recipe for your next Cinco De Mayo celebration. First, in a medium saucepan over medium-high heat add the milk and cream cheese. Next, let them both simmer until the cream cheese melts. Last, stir in the shredded cheese and keep stirring until the all the cheese melts to create a smooth, creamy cheese sauce. Add salt and pepper to taste. First, preheat your oven to 350 degrees F. and spread a few tablespoons of the cheese sauce on a 9x9 inch casserole dish. Next, begin layering the enchiladas starting with tortillas. Tear them into halves so even layers can be built. Then add the tomatoes, chiles, and shredded cheese. Then, pour more cheese sauce over the layer and repeat the process until the casserole dish is full. Now, sprinkle any remaining shredded cheese on top, cover the dish with foil, and bake for 20-25 minutes. Last, remove the aluminum foil and finish cooking the enchilada casserole uncovered for an additional 10-15 minutes. Serve the dish while it's hot. *The calories listed are an approximation based on the ingredients. Actual calories may vary based on substitutions and garnishes. The enchilada casserole can be stored in your fridge for up to three days in a sealed container. Yum! Reminds me of a dish my mom used to make. Yum! That seriously looks amazing! I need to try that! This looks amazing!! I love casseroles like this and it is definitely going on the meal plan. This recipe sounds delicious and so easy to make! It’s going on my meal plan for next week. Thanks for sharing! This looks so yummy! I’m going to bookmark this so I can make it next weekend when I have company over.